Royal Caribbean has announced the winter 2014-2015 Brazil and South America cruise schedule for Splendour of the Seas. 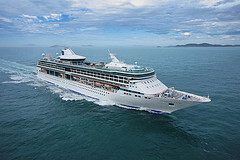 Splendour of the Seas will sail roundtrip out of São Paulo, Brazil and offer three- to eight-night cruises with port stops at Buzios, Ilha Grande, and Ilhabela. In addition she will offer seven-night Argentina and Uruguay cruises, calling at Punta Del Este and Montevideo, Uruguay; and Buenos Aires, Argentina. Included in this schedule is a special eight-night holiday cruise that leaves on December 27, 2014 and will visit the ports of Porto Belo, Buzios, Ilha Grande and Ilhabela, and herald in the New Year at Rio de Janeiro to catch the world-famous fireworks show at Copacabana Beach. Splendour of the Seas’s winter 2014-15 Brazil and South America cruises are now open for sale. Lisa Bauer, Royal Caribbean executive vice president of Global Sales and Marketing, commented on the news, "We are glad to bring Splendour of the Seas back to Brazil for an eighth winter season. Splendour of the Seas combines a vast array of new and modern features and conveniences, exciting itineraries, and our world-renowned friendly and engaging GOLD Anchor Service to deliver a unique South America vacation experience that can only be found on Royal Caribbean. And our award-winning family programming will help make a vacation to the region an unforgettable experience for all ages."